When it comes to cloud computing, companies are given the opportunity to create and tailor their own cloud ecosystem. However, this isn’t necessarily a piece of cake. 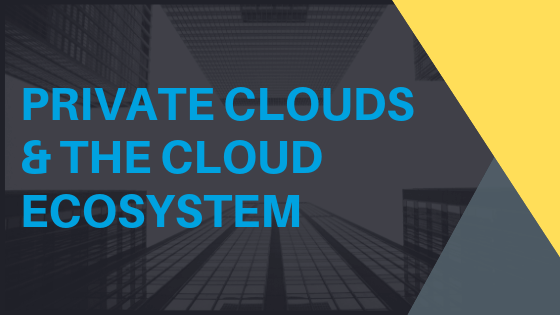 In today’s blog we’re taking a step back in order to introduce cloud ecosystems before defining how private clouds can fit within it. What Is The Make-Up Of A Cloud Ecosystem? The cloud ecosystem is essentially made up of numerous entities that take on the different roles of delivering, supplying and consuming cloud services. Each of these entities, coupled with how they interact with each other and what they bring to the table, in turn, defines the ecosystem. While these ecosystems can be diverse, there is one thing that they have in common – the value that they bring to businesses. This value can be in the form of simplifying the analysis of data collected from various applications or even minimizing the risk of vendor lock-in by making the options of multiple providers available. So Where Do Private Clouds Fit In? The public cloud is often where most organizations start in terms of cloud adoption, however, these ecosystems can be branched out into hybrid platforms or private cloud only platforms as well. Although private clouds may not qualify as a cloud ecosystem on their own, it is possible for the providers, the services and applications to make up the structure of the required network, thus transforming private clouds into an ecosystem of their own. When it comes to the management of a private cloud, businesses also have the option of keeping it in-house or contracting a managed service provider, both of which VEXXHOST can provide, effectively making us a part of their private cloud ecosystem. Such an inclusion makes it possible for us to grant companies access to all of our other offerings. However, as VEXXHOST’s offerings are powered by OpenStack, there is no risk of incurring a vendor lock-in situation. In sum, cloud ecosystems simply consist of the resources and services provided or made available to the business in question by various suppliers, including partners, consultants and even consumers. A private cloud can fit in to such an ecosystem either in tandem with a public cloud, resulting in a hybrid cloud ecosystem or on its own through the network of suppliers, services and applications. Ensuring that your selected cloud vendor can deliver on all of your needs is vital. With VEXXHOST, whether the private cloud is on-premise or hosted by us, we can fully manage it or simply provide support as needed. VEXXHOST also offers consulting so that you can begin your cloud journey with confidence. For more information on how VEXXHOST can help you build and perfect your cloud ecosystem, contact us!